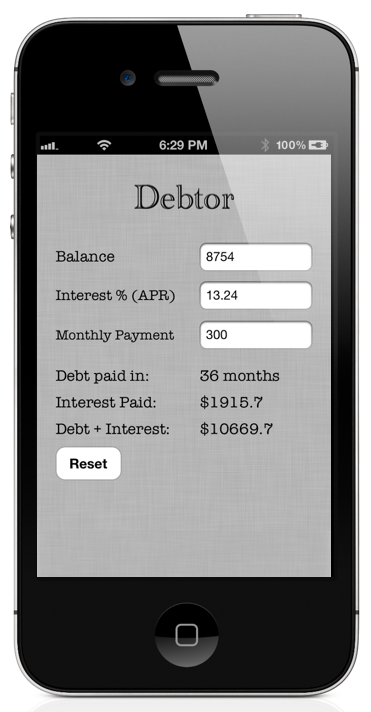 My first iOS app, Debtor, is now available for free on the App Store! At this time it’s for iPhone only. View it in iTunes here. I came up with the idea for Debtor when I was working on my household budget, and I wanted to calculate how much money I should set aside for credit card bills. The goal is always to pay them off as soon as possible- but how much can I save by paying them off sooner, and how much money does it really cost to pay off a balance of, for example, $5000? With an APR of 11%, and a monthly payment of $300, Debtor will calculate that you will pay $460.65 in interest, for a total of $5460.65. This is just the beginning, version 1.0. I am currently working on an update, which will add features and fix bugs, so keep an eye out for that in the coming weeks. Author barryjbroPosted on April 8, 2012 April 8, 2012 Categories programmingTags app, ios, iphone, itunesLeave a comment on Introducing Debtor for iOS!